In 6-quart Dutch oven, cook and stir sausage and bell peppers over medium-high heat about 8 minutes or until sausage is no longer pink; drain. Reduce heat to medium-low. Stir in tomatoes and basil; cover and simmer 10 minutes. Meanwhile, cook and drain pasta as directed on package. 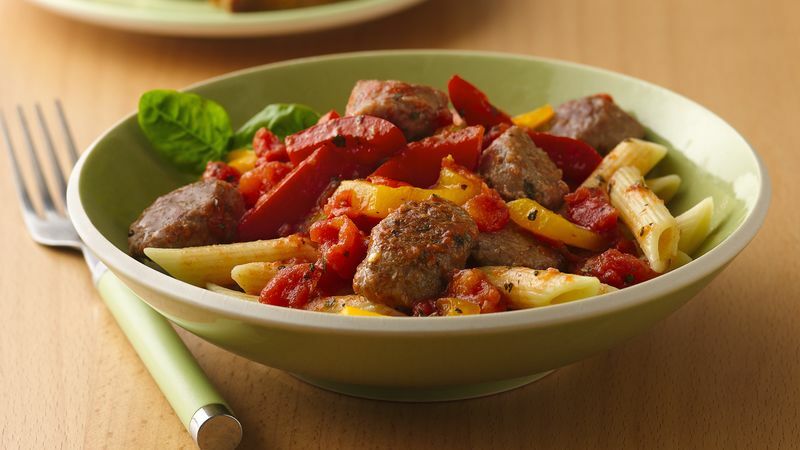 Serve sausage and peppers over cooked pasta; top with cheese. Cook the pasta while the stew is simmering; everything will be done at the same time. Italian turkey sausage has less fat than most other Italian sausage, making it easy to use in a stew.